If you have ever shopped for a pill organizer, you probably know how complicated the process can be. Pill organizers come in many shapes and sizes, and they have a variety of different features. Here are a few things you should look for when shopping for a pill organizer for your elderly loved one. It is imperative to avoid any sort of confusion in your loved one’s medicine regimen. Select a pill box with clear and visible labels so he or she can easily select the right medications. Many seniors prefer color-coded boxes with different shades for each day of the week. Seniors with impaired eyesight will appreciate a pill box with raised or Braille lettering. Hiring a professional caregiver is one of the best ways to ensure your senior loved one takes his or her medications on time. In Winnipeg home care providers can benefit aging adults in a variety of ways. From cooking nutritious meals to offering timely medication reminders, the dedicated caregivers at Home Care Assistance are available to help your elderly loved one 24 hours a day, 7 days a week. Avoid getting one of those little plastic pill organizers used for traveling because their snap-on lids and thin, foldable hinges quickly break when they are in use every day. Make sure to find a pill organizer that can stand up to months of wear and tear without losing pieces or fading labels. Look for a pill organizer made with thick plastic with real hinges and latches. Make sure the pill box you choose can easily hold all of your loved one’s medications. Most pill boxes are designed to hold a week’s worth of medications, and you can even find some large ones that hold up to a month of pills. Depending on your loved one’s health needs, you may need a pill box with individual compartments for morning, afternoon, and evening dosages. 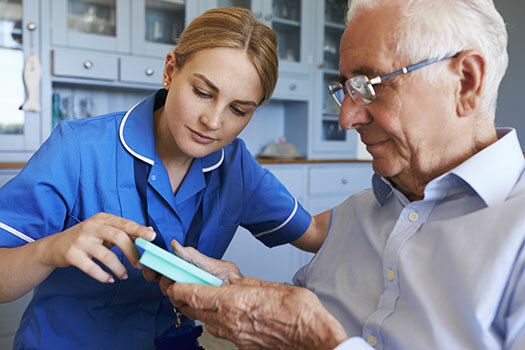 Seniors who need help with medication management can benefit from professional in-home care. If your senior loved one needs hourly or live-in care, Winnipeg Home Care Assistance can help. Our caregivers can assist with exercise and mobility, prepare nutritious meals, provide timely medication reminders, and help with a wide array of other important daily tasks. Arthritis and other mobility issues can make it difficult for seniors to use tiny compartments and complicated catches. A good pill organizer will be extremely easy to open and close. Consider choosing a pill organizer that operates with the push of a large button so your loved one can retrieve the pills easily. Many seniors find that a pill box that lets them dump the pills into their hand works better than one that requires them to use a pinching motion to retrieve each pill. With modern technology, there are plenty of pill box options for those who want additional features. If your loved one is having difficulty taking his or her medications at the right time of day, it might be better to invest in a high-tech pill box. Some pill organizers have an alarm, while others will not dispense more than a day’s dosage in a 24-hour period. From managing their pills to performing basic tasks, seniors may need help with several everyday activities. Aging adults who need help around the house, transportation to medical appointments and social events, and assistance with exercise can benefit from having an in-home caregiver. Winnipeg seniors can enjoy greater independence and receive regular mental and social stimulation when relying on a trusted professional who is expertly trained in various aspects of senior care. To hire a dedicated caregiver, call Home Care Assistance at (204) 489 6000 today.